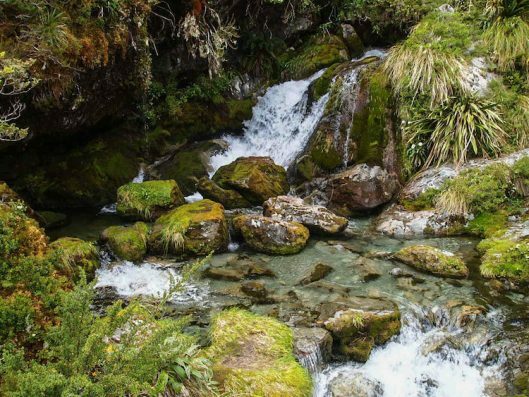 The Routeburn Track is a 32km traverse through New Zealand’s Southern Alps that links Mount Aspiring and Fiordland National Park. The trail weaves through meadows, ice carved valleys, alpine lake shores, and forests all while presenting stunning views of the rugged snow capped mountain peaks. 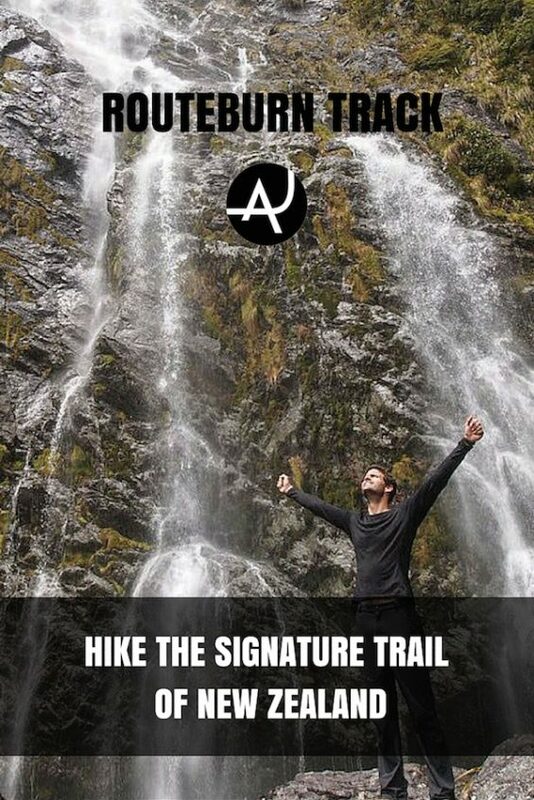 It’s considered one of the best hiking routes in the world. 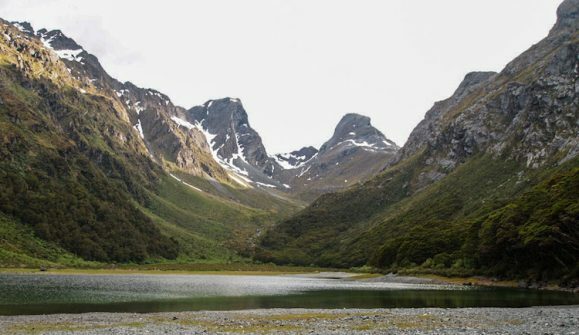 These views, combined with the smell of oxygen-rich rainforest, the songs of native birds, the taste of cold glacial water, and the feeling of mist from the waterfalls helped us achieve the ultimate goal of trekking: to feel close to nature. The Track has two starting and finishing points and may be walked in either direction. One track end is at the Routeburn Shelter (near Glenorchy and 68 km from Queenstown). 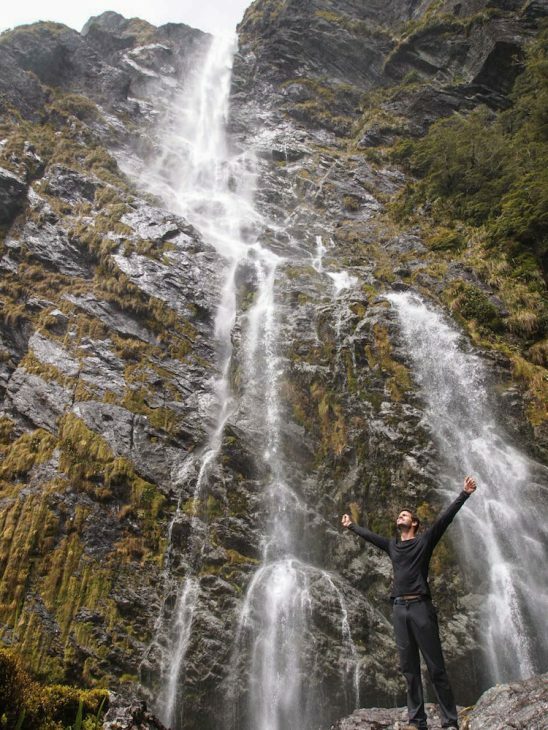 The other is at The Divide (on the Milford Road, 85 km from Te Anau). 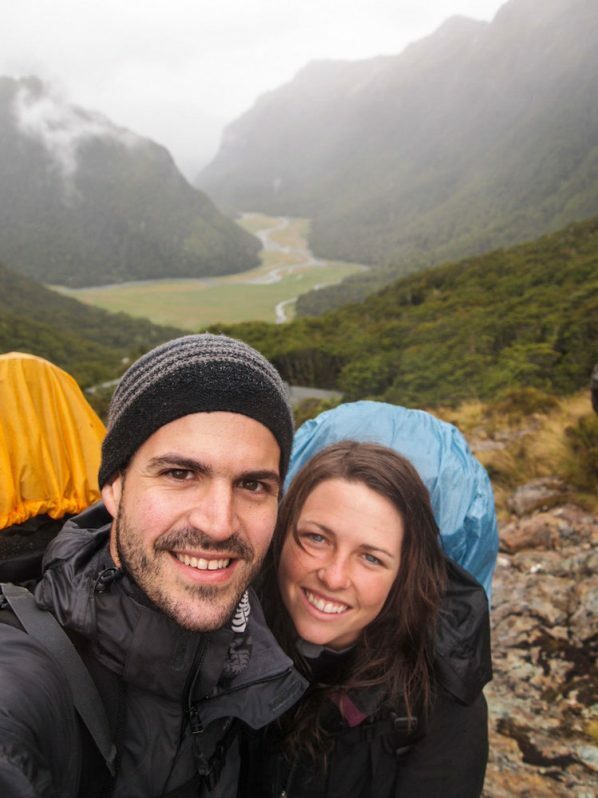 We spent 3 days/ 2 nights on the Routeburn trail and started from the Divide. The Routeburn Track is one of nine of New Zealand’s Department of Conservation’s Great Walks. These Great Walks are of a higher standard than most other tracks so are well formed and easy to follow. 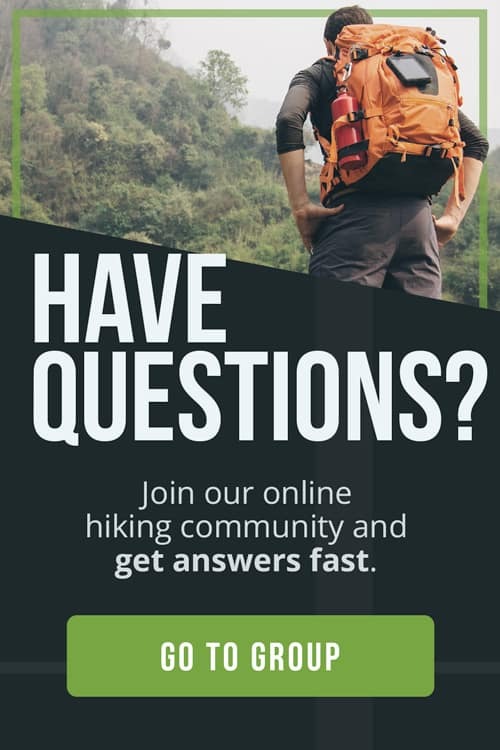 There are no services along the trail, only huts and campsites. As we went during the high season (the end of December) we had to camp as all of the huts were full. 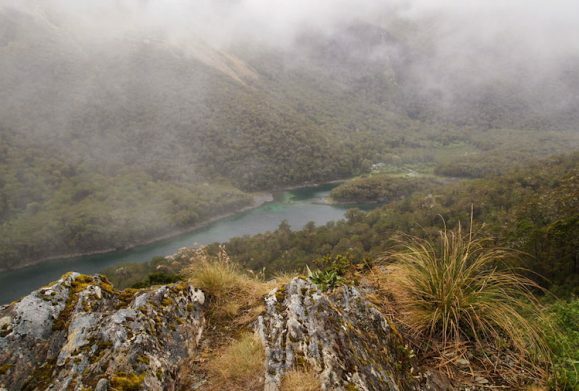 From the Divide, we began a gradual ascent through beech forest to the Lake Howden Hut. A bit more along the trail we came to our first impressive view of the day, Earland Falls (174 meters high). Standing under the falls and feeling the cool mist was refreshing after a few hours on the trail. From the falls we eventually reached a grassy meadow. As we approached Lake Mackenzie, we were relieved to have completed the first day of trekking, 12km, which took us about 5 hours to complete. The campsite is a short walk from the water’s edge. The next morning, we left the shelter of the rainforest and began our ascent into the alpine zone. 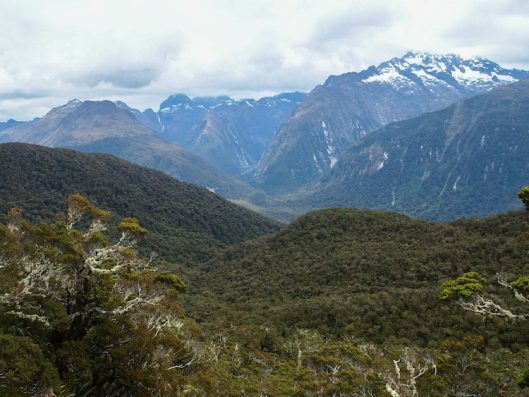 The thick mist of Fiordland covers the valley, but from the lookout point in the photo below, we could still see how far we had come: the campsite is situated in the middle of the photo. 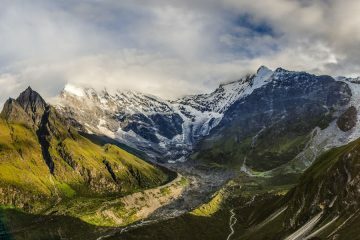 During the last ice age, which ended 14,000 years ago, a huge glacier flowed down the Hollyford Valley, carving out its U shape. From this pass we would start our climb up to Harris Saddle. For the next few hours, we faced rain, dense fog, and high winds. As we hiked along the ridge, I didn’t talk to Antonio. The intensity of the wind makes communication difficult. As the rain hit my face and the wind roared past my ears, I fell into an unintentional meditation. After a steep zig-zagging trail, we reached Harris Saddle, the highest point on the track at 1,225m. The water of the glacial Lake Harris is a gradient of hues, ranging from emerald at the edge to deep blue to slate grey. 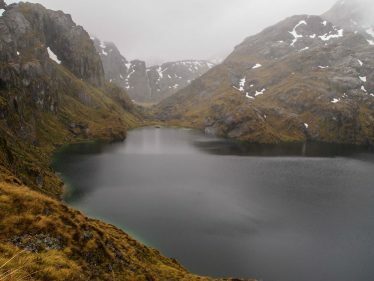 Alpine tarns and white Mt. Cook buttercups cover the lakeside slopes. 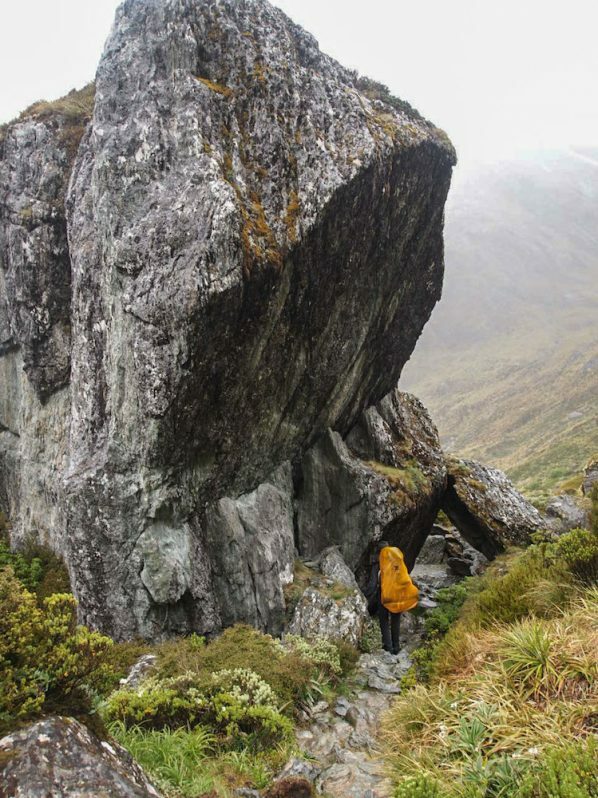 90% of New Zealand’s mountain plants are unique to the island, thanks to 80 million years of geographical isolation. 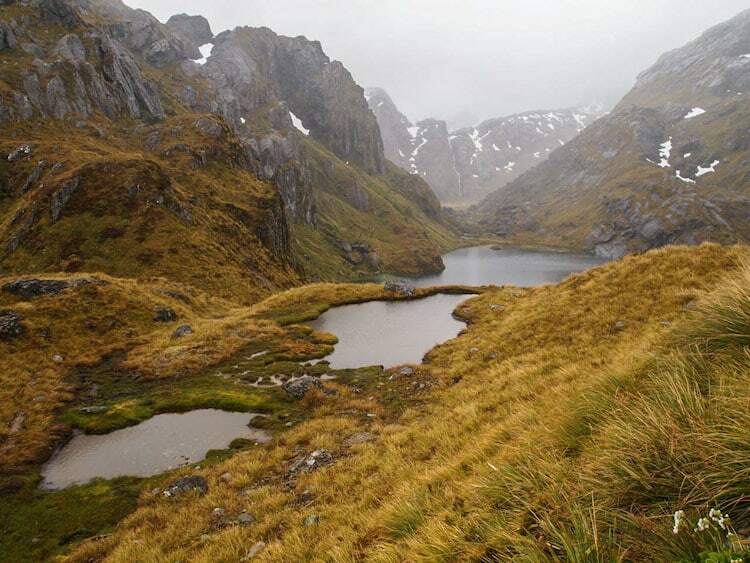 After reaching the pass we began to steadily descend into a valley, coming to wetlands and tussock-covered flats. After one last look at the stunning views of the mist covered Darran Mountains we head back into the bush. In contrast to the harsh alpine conditions we faced just hours earlier, the bush (the Kiwi word for rainforest) is pulsing with life. 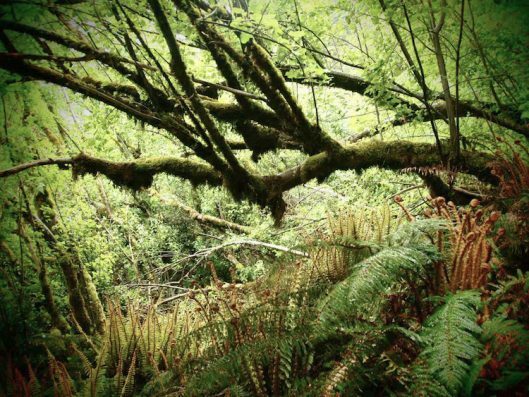 Mosses and lichens cover the trees and path, creating a world of green. New Zealand has no native mammals; however, the islands are home to a vast variety of bird species. Here in the bush, you can hear the songs of tomtits, robins, fantails, wood pigeons, and bellbirds. The very lucky may spot a kea, the world’s only alpine parrot. After trekking 13.6 km, a 7 hour day of walking we arrived to the Routeburn Flats campsite. 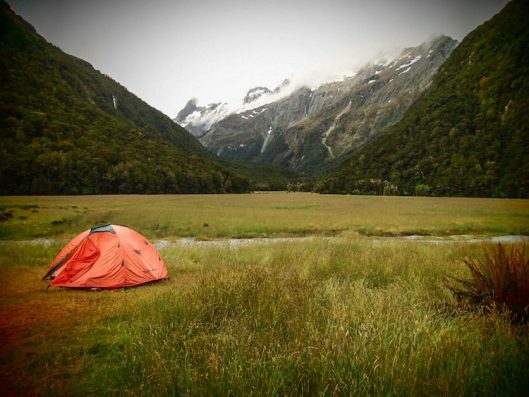 We pitched our tent in the long, grassy flat just beside the river and watched the sun disappear behind the mountains. The next morning we packed up and started off on the last stretch of the track. This was by far the easiest day of walking, where the trail takes you through a beech forest that runs alongside many streams, creeks, and rivers. 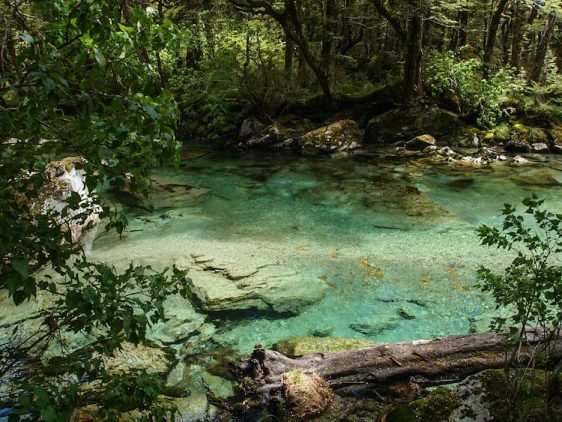 The landscape of the Routeburn track is dramatic, with the bright turquoise hue of this river as no exception. Our tired legs were thankful for this short day short day of only 6.5km, 1.5 hours of walking to reach the finish point. Our friend had dropped us off at the start of the track and we didn’t plan any pick up service. Instead, we began walking towards, sticking our thumbs out at cars passing by (hitchhiking is common and safe in New Zealand). Eventually a friendly Kiwi couple picked us up and dropped us off in Queenstown. Bring all the right gear for all conditions (weather can change very quickly in this region). 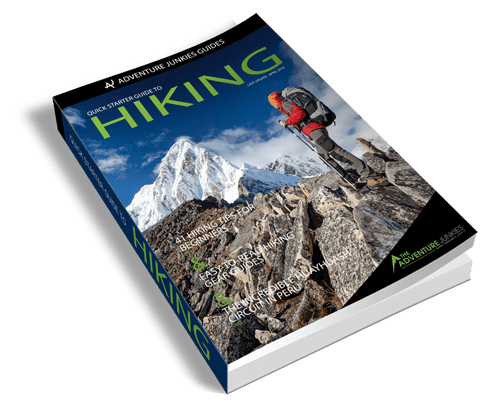 Carry more than enough food – While this is a fairly easy hike it’s always good to bring more food than you intent to eat. Book your trip well in advance including your accommodation, transport and transfers to the start/end of the track. The track can be completed at an easy pace in 3 days, 2 nights. The Great Walk Season is from October to April. While the track is more crowded, this is when the weather conditions are at their best. If you plan to start from The Divide you will need to drive from Te Anau or take the shuttle service. It’s 85 km (about an hour drive). If you start from the Routeburn Shelter you will need to drive or get dropped off from Queenstown. If you plan to drive yourself, there is a car relocation service that will drive your car from one end of the track to the other, so it’s waiting for you when you finish. The beautiful alpine landscapes of mountains, valleys and lakes. The trail is one way so you don’t walk back the same way you came. Like all of New Zealand’s Great Walks, the track and bridges are very well maintained and easy to follow. Nothing! We loved this trek! 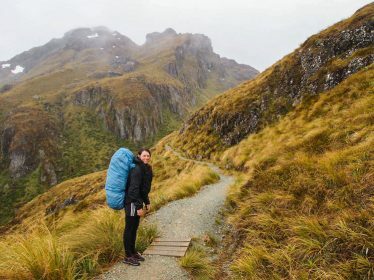 Hiking the Routeburn Track is one of the most accessible and enjoyable ways to experience New Zealand’s alpine environments. It’s a diverse walk that takes you through many unique landscapes which makes everyday exciting. Location: The Divide or Routeburn Shelter in Mount Aspiring and Fiordland National Park. Price: No fee to walk the track but you must pay for the huts / camping. 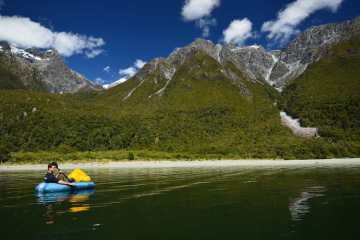 The fee during the high season (28 October to 29 April) are 54.00 NZD for the huts and 18.00 NZD for camping. Useful Notes: As I mentioned before, the weather can change very quickly. It’s important to have all the outdoor gear to keep you warm and dry if the weather turns bad. While this is a fairly easy track a moderate level of fitness is required. While there are resident DOC rangers that stay at the huts, you need to be prepared to be self supported. 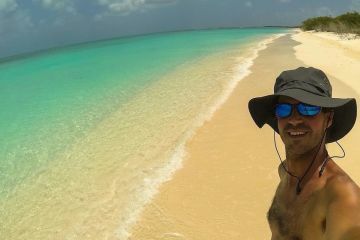 You need to be aware of all the risks that are involved when heading to this remote, unforgiving environment. Check out the DOC website for a list of potential hazards and how to prepare for them.